Digital cover art. (Original digital cover art including clone stamp). 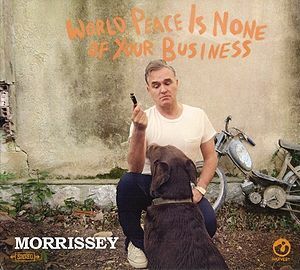 World Peace Is None Of Your Business is Morrissey's tenth solo album. The album was released on 14 July 2014 by Harvest Records. Produced by Joe Chiccarelli and co-written by Boz Boorer, Jesse Tobias and newcomer Gustavo Manzur, the album yielded 4 digital singles - World Peace Is None Of Your Business, Istanbul, Earth Is The Loneliest Planet and The Bullfighter Dies. Following the release of 2009's Years Of Refusal, Morrissey found himself without a recording contract. After a 5 year wait, Morrissey announced on 15 January 2014 that he had signed a two-album deal with Capitol Music and would commence the recording of his new album on 1 February 2014 in France with producer Joe Chiccarelli. On 7 March 2014 it was announced that the forthcoming album was finished, provisionally set for a late June/early July release through the Harvest Records label, and was entitled World Peace Is None Of Your Business. 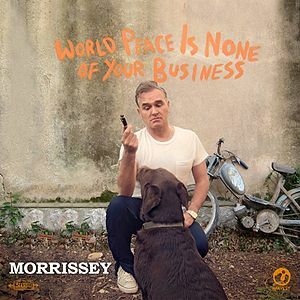 Prior to the release of World Peace Is None Of Your Business, Morrissey released the digital single "World Peace Is None Of Your Business" on 13 May 2014, which subsequently reached the #83 slot in the UK charts. Digital copies of the single were also given away as a free bonus for pre-ordering the album. On 9 Aug 2014, a statement on true-to-you.net claimed Harvest Records had ended its contract with Morrissey three weeks after the release of World Peace Is None Of Your Business. The album was pulled from streaming and download services shortly afterwards. 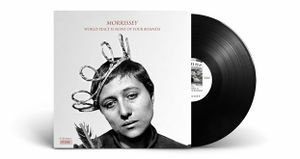 On 8 January 2015, Morrissey advised fans that a 45 of "The Bullfighter Dies" was scheduled for a global release by Harvest, but was scrapped by Steve Barnett at the last minute. The b-side was to be the original French mix of the song "One of Our Own". Further vinyl singles, including "Istanbul", "Kiss Me A Lot" and "Neal Cassady Drops Dead" were to include other French mixes of several songs as their b-sides: "Scandinavia", "Smiler With Knife" and "Art-hounds", and were available to pre-order from amazon.fr. However, these were also presumably scrapped. The album's cover features an image of Morrissey crouching down and offering a pen to a dog. This photo was taken elsewhere, and the cover itself features that image photoshopped and superimposed in front of a wall with the words "World Peace Is None Of Your Business" scrawled behind in orange text. On initial digital releases of the artwork, a clone stamp appeared on the left hand side; namely, a direct duplicate of the plant and brown tile next to Morrissey's leg became apparent. Most physical editions of the album had this corrected, though it still tends to appear on digital versions of the album's singles' embedded artwork, and on some physical copies. Largely, however, the clone stamp was removed for final in-store releases. A November 2016 re-launch with a new sleeve on Étienne (photo: The Passion of Joan of Arc, Dir: C.T.Dreyer) was proposed and plans were in place as of August 2016, but has not materialized. ↑ Harvest ends contract with Morrissey - TTY (2014-08-10). Morrissey-solo. Retrieved from morrissey-solo.com. ↑ WPINOYB to be reissued by Étienne, Nov. 2016 with new sleeve - Typical Moz e-zine/ Facebook (2016-08-05). Morrissey-solo. Retrieved from morrissey-solo.com. ↑ TTY: Morrissey Ticket Sales; "World Peace..." re-launch confirmation (2016-08-10). Morrissey-solo. Retrieved from morrissey-solo.com.